Bali – The land of my favourite Frangipanis – GET SET WHOA ! P.S. : I’ve rearranged this Bali itinerary so as to fit everything better, avoiding the mistakes we made. More Cheat Sheets at the end. Bali Tip No.1 : Be careful with your currency conversions. $1 = ~IDR 13,700; Rs.1 = ~IDR 206. (As of Nov 2015) Because of the huge difference, zeroes can get missed out and you can end up losing a lot of money. The first thing about Bali is that, it is a low-cost holiday option and if you know how to spend and where to spend it is totally worth every penny. 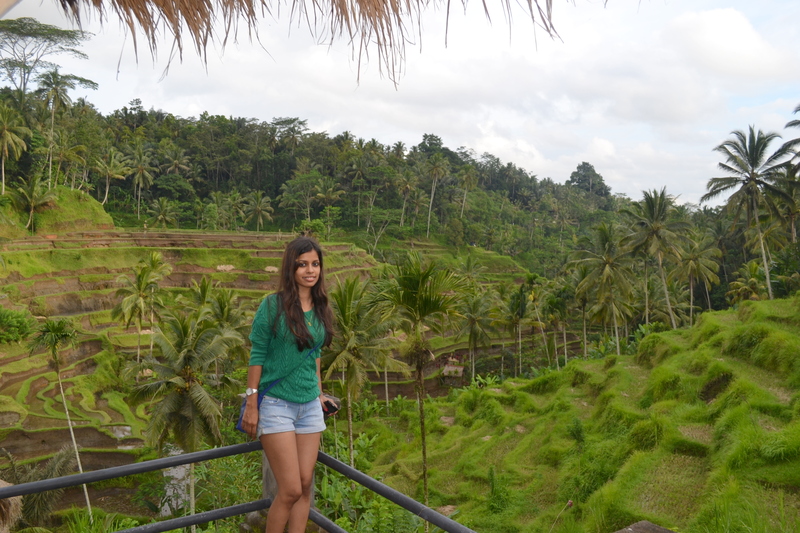 So there are basically 2 areas that you have to cover in Bali – Ubud and Kuta regions. It was an 8D 8N trip and our flight from Kochi was a late night one, at 11.30 PM, had lay-over in Kuala Lumpur airport and reached Denpasar (Capital of Bali) airport by afternoon on Day 2. We bought new sim cards at the airport and topped it up with data and calls, (Cost – ~IDR300,000 – $23/Rs.1500) then took a cab (from counters on the right side of the exit lobby area) and headed straight to Ubud. You can also arrange airport pickup from hotels, but they tend to be a bit more expensive. The resort we booked was ‘Kupu Kupu Barong’ (www.kupubarongubud.com) which means ‘Giant Butterfly’. 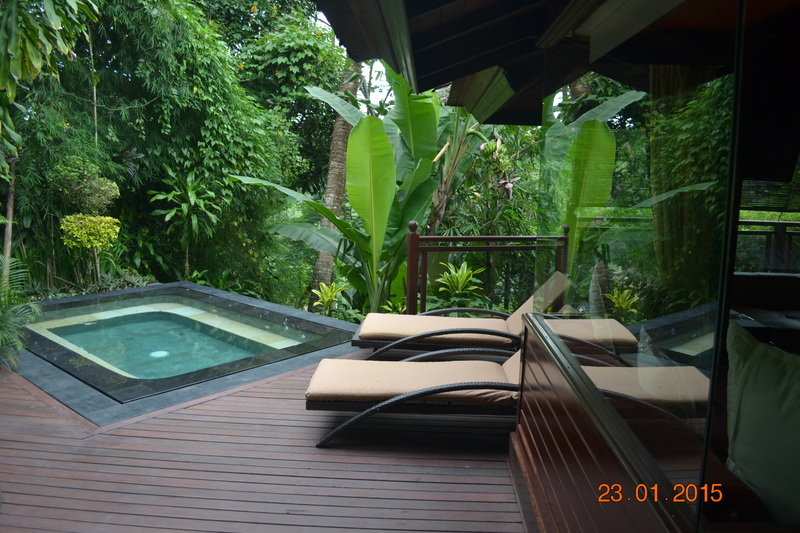 We had this pool villa overlooking Ayung River and boy, was it dreamy! 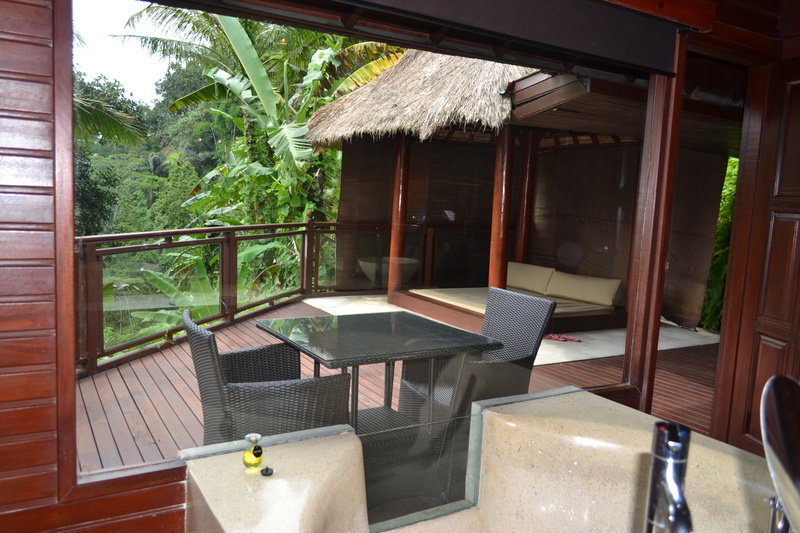 It had a bedroom, bathroom and Jacuzzi area surrounded by balconies that have a view of the flora around and you can spot the Ayung river down below as well. Also, there was a patio area with coffee tables and a deck with bed and pillows for relaxing. We had lunch at one of the restaurants in the resort and relaxed in our villa pool. In the evening we headed towards this restaurant called ‘Mozaic’. 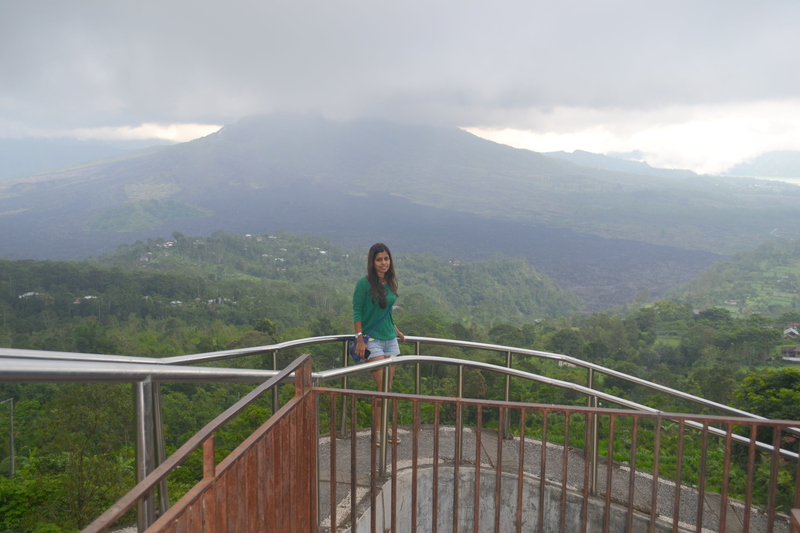 It was on top of the list of must-visit places in Bali. The place and food was exotic, but one meal costs around IDR 1.3mn ($100/Rs.6600). So you can consider how deep your pockets are, and then decide if it is worth visiting or not. Next day was jam-packed. We had made arrangements with the previous night’s cab driver to take us to a list of places for the whole day and he charged us IDR 300,000 ($22/Rs.1450), which was quite reasonable. You can find many such cab drivers in the city centre. Usually they have a considerably lesser rate than what the hotel or tour companies charge you. Also since Bali is an extremely touristy place and tourism is their main source of income; so you don’t have to worry about any mishaps even if you arrange everything by yourself. Bali Tip No.2 : Do not listen to your Cab driver and buy Sarongs for temples. Insist you will buy them at the temple. 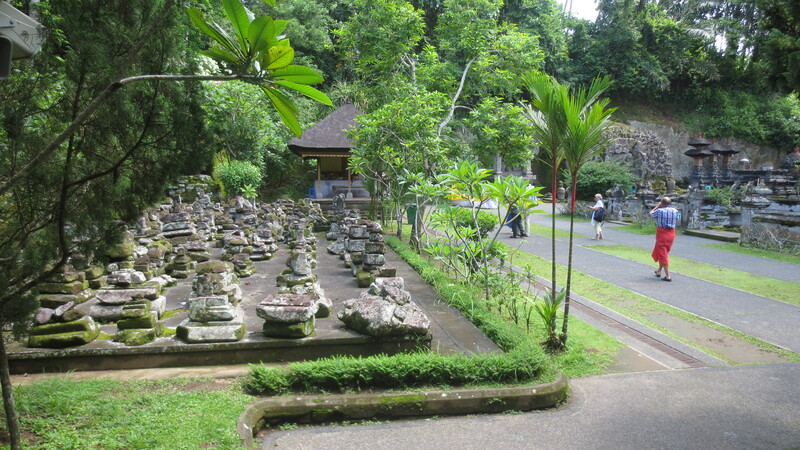 First we stopped at 2 Hindu temples in Ubud main area itself. Bali is a majorly Hindu populated area though Indonesia itself is a Muslim country. It is the only other place in the world – other than India and Nepal – where Hinduism is so widely practised. Because of the same reason everywhere we went, the first question sprung at us by the Balinese people was ‘Are you a Hindu?’ And if we said yes (which we din’t say, ofcos), they seemed mighty pleased to have met us. 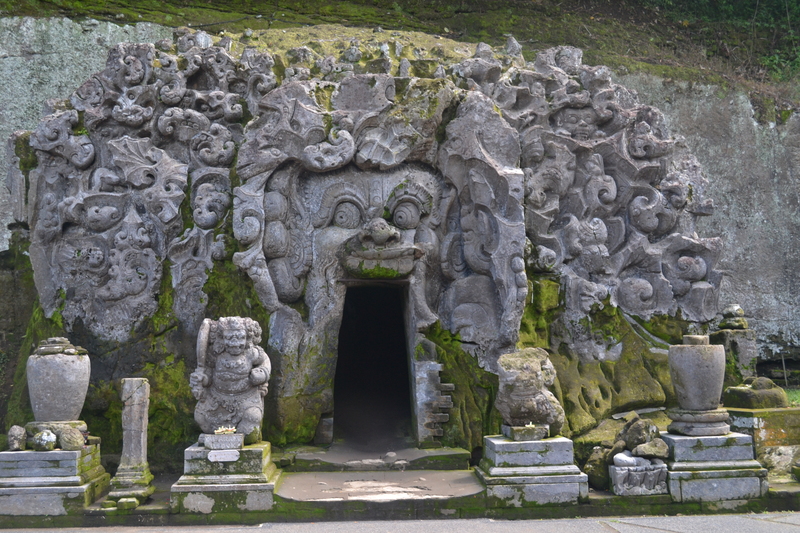 The first temple was Pura Goa Gajah – Elephant Cave Temple (IDR 15,000 – $1/Rs.72) (‘Pura’ in Bali means ‘Temple’). On the way to the temple, our cab driver said we need sarongs if we were to enter the temples, and stopped at a boutique from where we bought 2 sarongs each worth IDR 165,000 ($12/Rs.800), that too after bargaining. He had said that the temple premises did not have sarong shops and we arrived there to see sarongs sold at IDR31000 ($2.5/Rs.150) !! And the worst part was that, it was not even a mandatory custom. Nobody except us was wearing sarongs. In fact once inside the temple premises, we looked like some jokers draped in these colourful lungis! I figured the cab driver must have had got some cut for bringing us to the boutique. 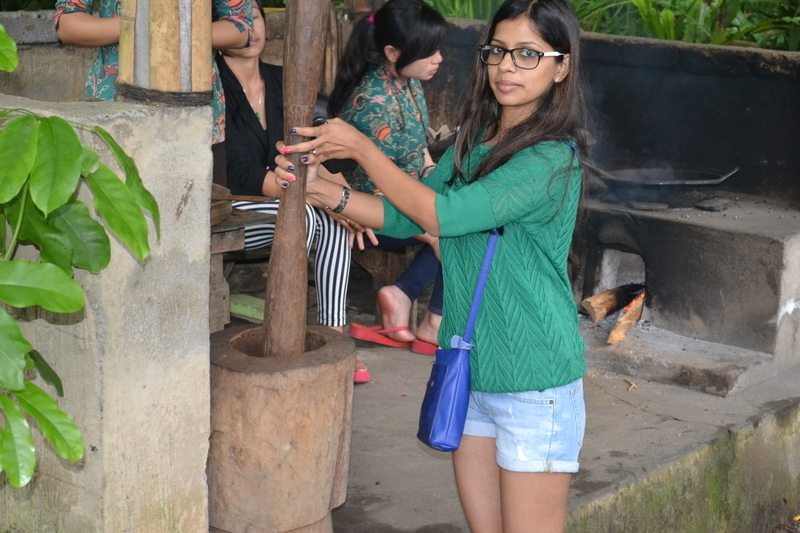 Anyhow, pissed as I was, I still enjoyed Pura Goa Gajah. The place resonated of ancient Hindu culture with idols of Lord Ganesh, Shiva Linga and other deities, along with a Hindu priest performing some rituals. There was a cave where deities were worshipped, outside of which was adorned with some very intrinsic rock sculpt works. 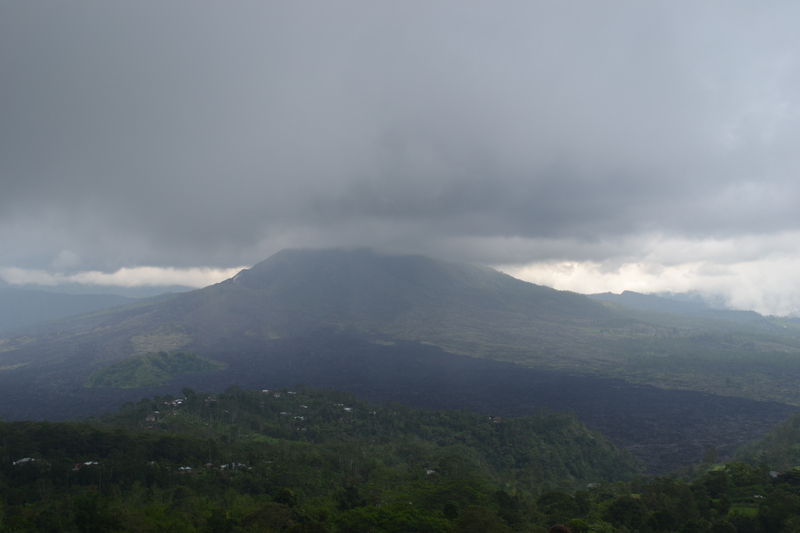 After that we went straight to Kintamani, which is high-range area, from where you can have a beautiful view of Mount Batur. The view was breathtaking and worth having travelled an hour to reach there. There are some restaurants right at the centre of the attraction, but those were all too crowded that we didn’t feel like going in. We spotted these black puppies, very cute ones on sale. If I could fly them back with me, I’d have bought one of them for sure! 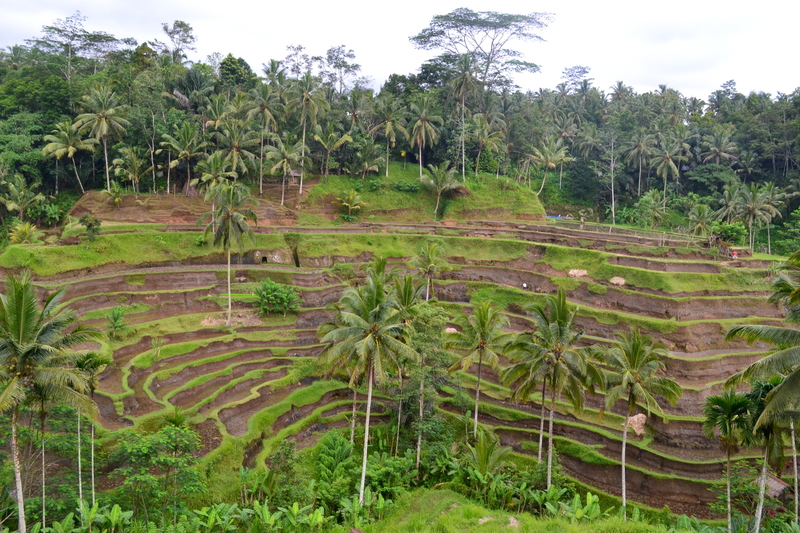 We started back towards Ubud area and on the way, we stopped at the world famous ‘Balinese Rice Terraces’. It is quite something, though for Keralites like us, rice fields are nothing new. However, terraced rice cultivation was a new concept in itself, though the time of the year we visited was not harvest season and hence the terraces weren’t so green and pretty. We had lunch at Tegallalang with the rice terraces in the backdrop and refreshing air caressing us. 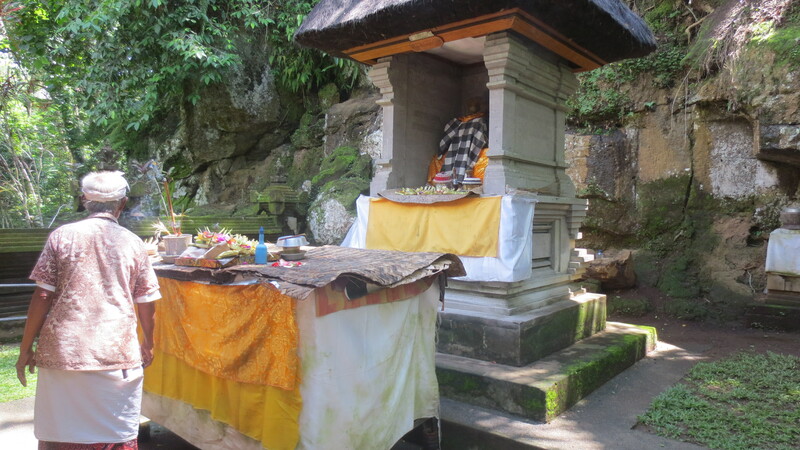 Our next pitstop was Pura Gunung Kawi – Entrance Fee IDR 15,000 ($1/Rs.72) and No sarongs required. My research said this is a temple that isn’t so popular as the other main ones. However, the pictures were enigmatic enough to draw me to the place. And boy, did the pictures not lie one bit! Just beyond a rice terrace, nestled between coconut trees was this ancient temple and funerary complex from the 11th century, with all its enigma still intact. Once you enter you see the funerary monuments of King Anak Wungsu and his favourite queens, comprising of 10 rock-cut shrines carved into 7-metre-high niches of the cliff face. There is a small bridge across a spring, from which water was gushing from somewhere distant. We found the temple to be quiet and peaceful since we were the only people inside at the time, and I’d suggest it as a must-visit. 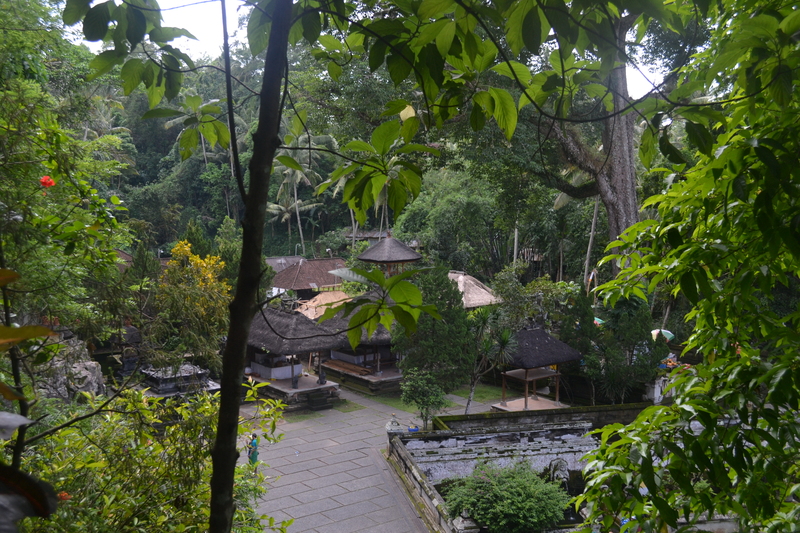 The next stop was at Pura Tirta Empul – Temple of the Holy Water (IDR 15,000 – $1/Rs.72). (Here also sarong is NOT compulsory). This temple had few different pools, where people where seen taking bath, which is supposed to be holy. In my opinion, this one is not that great, and can be skipped if time is a constraint. On the way to Monkey Forest, we checked out Pura Taman Saraswati (Free entry) which is a Hindu temple right in the heart of Ubud city centre. It has beautiful Balinese architecture written all over it. (There was some performance that was about to happen there, and hence the place was arranged with chairs and we couldn’t get a good picture of just the temple alone) Actually it makes more sense to club this temple visit with traditional dance shows which are conducted right next door. Our last destination for the day was ‘Sacred Monkey Forest Sanctuary’ (IDR 30,000 – $2/Rs145), at one end of the Ubud City centre. Unfortunately we reached there by around 5.15, and since the place was closing by 6 pm, we couldn’t get much time to hang out there. But with the little time we had, we did roam around to most of the areas, except for the temple inside the sanctuary. It looked like the place had a myriad of trees (115 separate species of trees to be precise) and a million monkeys to keep them occupied. The calmness of the forest and the coolness of the atmosphere made us feel more in touch with nature and I so wished I hadn’t arrived there at the last minute like this. From there we headed back to the hotel, relaxed in the villa, took a dip in the pool, ordered room service and had a laid back evening. 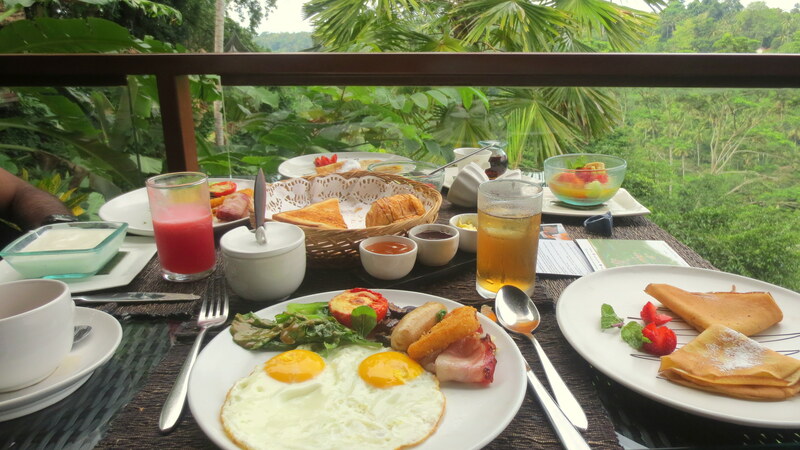 The next morning we had a quick breakfast at the ‘La View restaurant’ at our resort, which boasts of this breathtaking view of Ayung River from above. I had scheduled white water rafting for the morning at Toekad Rafting (IDR 318,000 – $75/Rs.5000 per person) and they sent a driver to pick us up from the hotel. 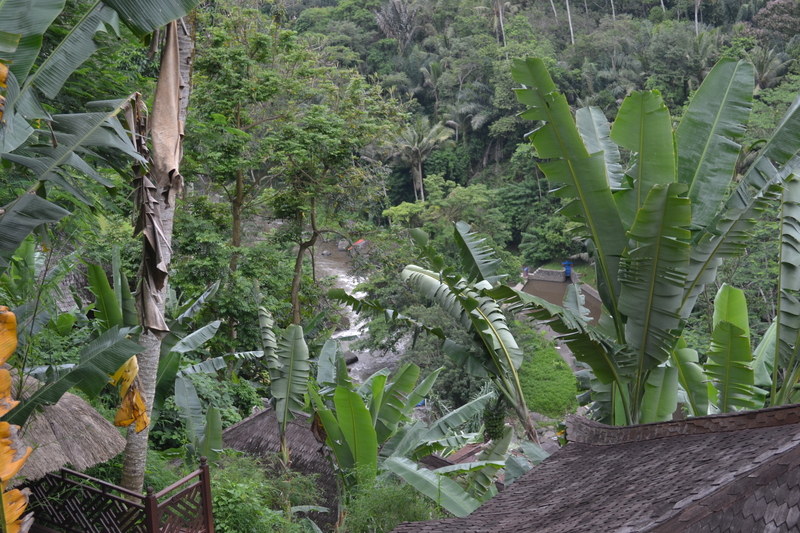 There are 2 rivers where you can do rafting – Telega Waja River and Ayung River. The experience was calming and refreshing as opposed to a thrilling and exciting rafting experience I had in Lake Kaituna in New Zealand (the highest commercially rafted waterfall on the planet). The rapids in Ayung River were of class grade 2-3 and are very suitable for beginners and children and lasted for about 1.5-2 hrs. (Telega Waja has rapids of class grade 2-4 and is more adventurous. But it is 1.5 hrs from main Ubud area where tourists stay) Toekad Rafting (http://www.balitoekadrafting.com/) was very professional and they had neat areas for showering and changing and provided us with clean towels. Lunch was also included in the price, and they dropped us back to the hotel in the afternoon. Post noon we relaxed in the hotel room because we were too tired to even lift a finger. 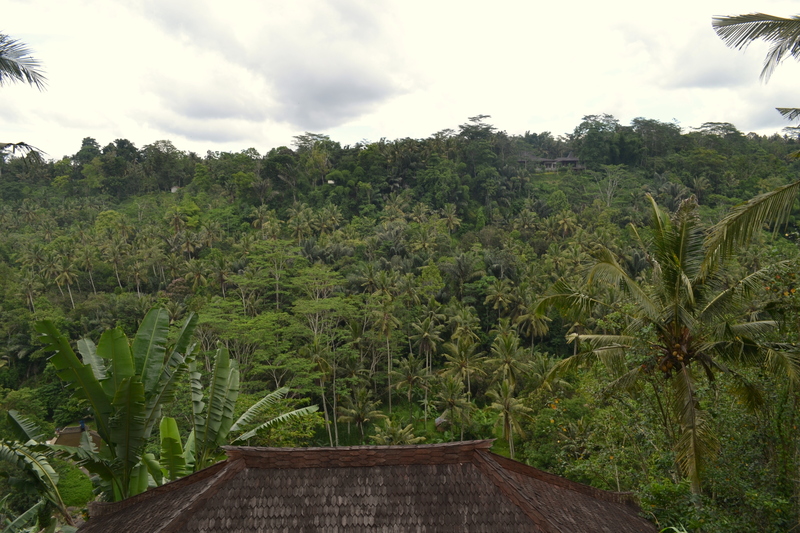 In the evening we took off to the Ubud city centre, strolled around, and searched for a Balinese massage centre. Finally we found one called ‘Kayma’ highly recommended by my friend who had been there earlier; took a couples Balinese massage and it felt like heaven. After the massage we went to this dance show centre near the temple where there was Traditional Barong Dance show. We bought tickets for IDR 80,000 ($6/Rs385) per head. They give cards to the spectators, for us to understand the stories that they were depicting on stage and most of them were stories from Hindu mythology. It was an interesting cultural experience and totally worth it for such a low price. The next day morning we checked out of Kupu Kupu Barong and started off to Kuta. It took about 2 hours to reach Kuta, which is this vibrant buzzing party hub of Bali. We checked into a sea-view room at Hotel Mercure right on Kuta Beach. In the evening we strolled around the beach and had a quiet dinner and drinks at this amazing restaurant called ‘Feast’ in Sheraton, which is right in the middle of all buzz and action of Kuta. The ambience was amazing, with the view of Kuta Beach right infront of us. And the best part is you literally get to lie down, put your feet up and relax, while enjoying dinner, ‘inside the restaurant’. Where else can you possibly hope to do that?! After a laid-back day it was time again for a day packed with spots to visit. After a quick breakfast at the seaview restaurant of the hotel we set out for Pura Luhur Uluwatu, an ancient 11th century Balinese Sea Temple. We hired a gearless bike (which is one of the most popular means of transport for tourists in Bali) which cost IDR 72,500 ( $5/Rs.350) per day. You can find bike hire areas all over Kuta. You just need to walk over there and settle on an amount to get the bike. Most people are not even bothered about your licenses. Also, one thing to keep in mind is that they will always ask atleast 3 times the price; they started with IDR 200,000 from which we haggled and brought down to this rate. We used GPS in one of our phones to get to Pura Uluwatu. The temple was mind-blowing, perched on top of a cliff with the vast expanse of ocean encompassing it. It has an entry fee of IDR 60,000 ($4.5/Rs.290) per head and is open 8 am-8 pm. Sarongs are provided at the entrance free of cost. It was quite sunny and we got burnt like a bacon. So I’d suggest carrying an umbrella if you are visiting before sundown is advisable. 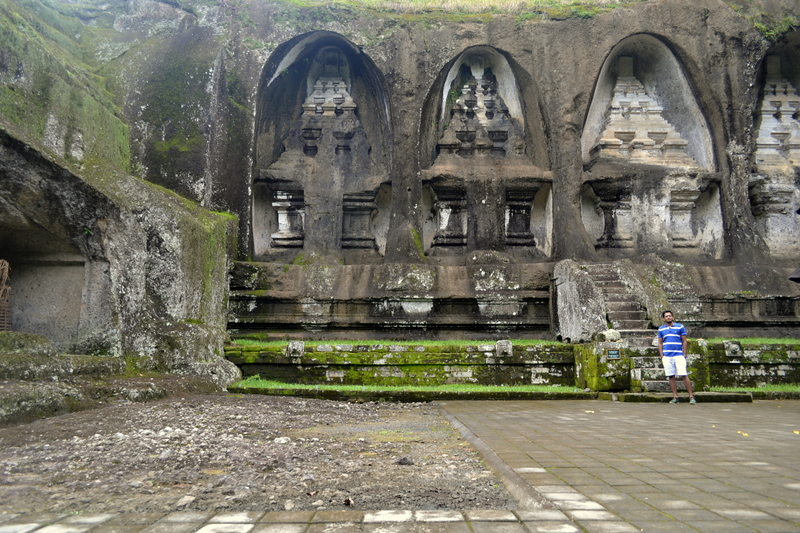 From there we started off towards the opposite side, to Pura Tanah Lot – a 16th century Balinese island temple. The temple sits on a huge offshore rock which is said to have moulded into the current shape due to the continuous ocean waves that keep hitting the shore. There is a large parking area where you can park your vehicle for a price of IDR 5000 (50 cents/Rs.25), and entrance to the temple costs IDR 30,000 ($2/Rs.145) per head. Once back in the hotel, we were too tired to even move our limbs; ordered room service and retired to bed early. Bali Tip No. 3: Never ever exchange currency at any local shops which claim to give you a considerably better rate. Go with registered, standard currency exchanges. Next day after a relaxed breakfast we did some street shopping in Kuta-Legion area. There are a lot of streets dedicated to just shopping. First thing we tried doing once we entered the streets was to exchange currency and we learnt a BIG Balinese lesson. Never change currency at places run by locals. Outside the shop they would have written on standees a substantially better rate as compared to standard, legal FOREX centres. We entered 2 such local currency exchange shops. At the first shop we gave $200 and the guy calculated the amount in IDR that he owed us, counted the notes and gave it to us. But while leaving the shop I started counting the notes and realized it is much less than the real amount. So we told him there is some mistake and he again counted and showed us that the amount is right. That time around, I caught his act. He was doing some card trick with his hands like magicians, where the spectator is fooled into believing what he counts as the right figure. And when we called his bluff, he suddenly put the money inside and gave us back our dollars and started shouting “Go away Go away.. No money”. Unbelievable!! The guy at the second shop was even worse. He took dollars from us and calculated the equivalent IDR in his calculator, but just before giving us the money he would delete one zero off the calculator screen. We kept arguing the amount isn’t right when he handed the currencies over, and he would show the calculator screen as proof. And he kept doing this trick on us, and we realized his ploy and told him ‘We are Indians, and FYI we invented ‘Zero’, so don’t try to dupe us with your “Zero tricks” and immediately he started shooing us off saying ‘Go go.. No money’. We did some street shopping, bought souvenirs and gifts for friends and family, also some nice Balinese home décor items for our apartment. I followed the rule of haggling that I learnt the hard way – when we bought the exorbitant ‘sarongs’. That Bali is highly touristy and shop keepers always ask for rates that are sometimes even 10 times the original price. Bali Tip No.4: Always start bargaining with shopkeepers at a price ¼ the amount and don’t ever settle for a price beyond ½ the rate they say. After the shopping we went back to the hotel, checked out, hired a cab and headed towards Nusa Dua, our final destination in Bali. We were given a warm welcome at Hotel Novotel Bali Benoa. Our villa was beyond words. The overwhelmingly gorgeous Indian Ocean lay infront of us in all its might and beauty. Sundecks, Balinese style outdoor bathtubs, a small private garden all made the villa all the more exotic. We had dinner from a local restaurant we stumbled upon during our night stroll. Next day I had booked ‘Flying fish’, ‘Undersea Walking’ and ‘Banana Boat’ for us at Tanjung Benoa Beach, which is supposedly the hub of all water sports activities in Bali. At first when I entered under water, I experienced some low pressure issues. But soon I got accustomed, and it seemed fine as long as I din’t move my head in upward or downward direction, and maintained a steady posture. We were given small plastic covers with slices of bread to feed the fish. It was really a remarkable sight when the fishes came rushing to our side when each bit of bread was left in the water. 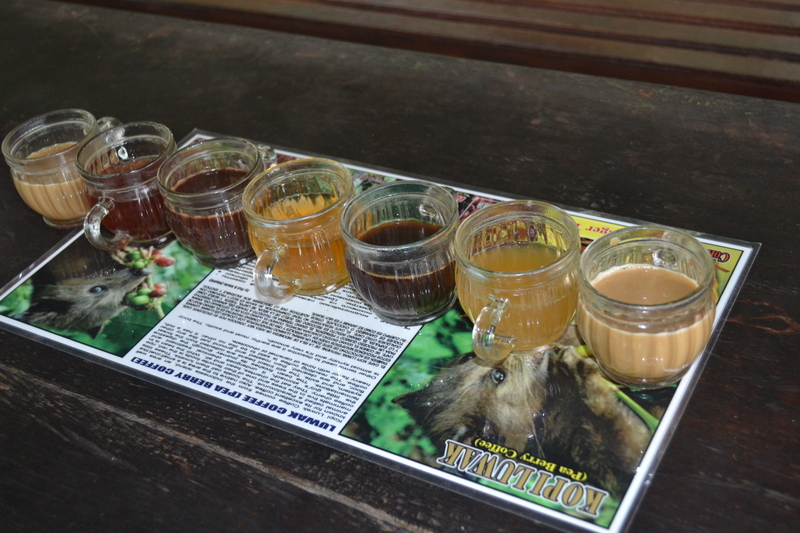 The whole package of 3 activities cost us IDR 1.1 mn ($80/Rs.5300) per person, which I felt was overpriced. But overall we enjoyed the day. Back in the hotel we took a dip in one of the big beautiful pools in Novotel, and in the clear blue beautiful expanse of sea right in front of our villa. In the evening we took off to ‘Bali Experience’ – a high-end shopping centre in Nusa Dua. I haven’t ever been to a shopping village with so much greenery and appealing architecture. It is a must-visit even if you don’t intend to spend too much on shopping. We bought some clothes and again gifts for people back home and headed back to the hotel. We were supposed to visit Ayana Bar, which is one of the highly rated bars in the world, however we chose not to in the end, because we were too tired and just wanted to get back to the hotel and sleep like logs. So we had a quiet dinner at our hotel Novotel, in Cocos Restaurant by the beach – our last night in beautiful Bali. Next day morning, after buffet breakfast at the hotel, we hired a cab and headed straight to the airport and bid adieu to beautiful enchanting Bali, with a promise to return sometime for our second honeymoon. Review: The villa was stunning with a private pool, lounge, outside kitchen, spacious bedroom with enough storage. The bathroom housed a splendid bath tub and had a shower area that could be opened up to work as an open air shower. All meals including breakfast is served in the room. 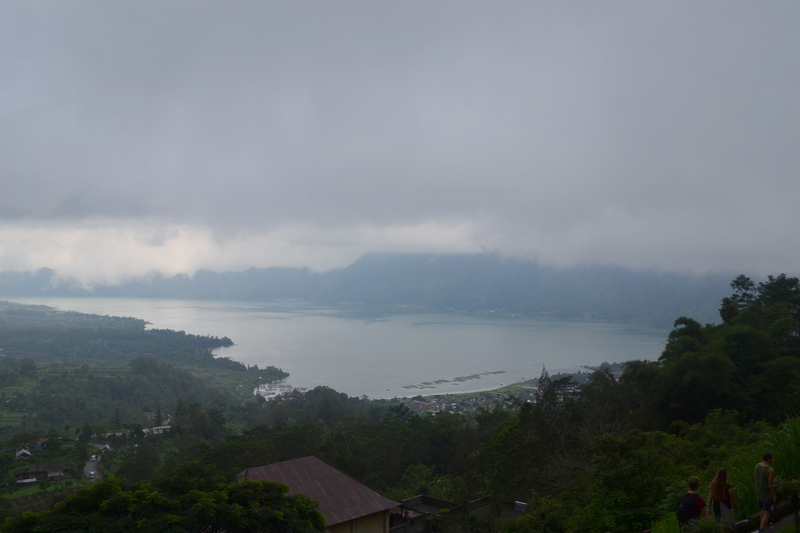 Mount Batur, temple and lake Batur – carry your own sarongs, the ones sold near the temple is over priced. Batuan Bali – home of arts. Review: The deluxe room was spectacular. Their infinity pool was amazing, we spent a lot of time there. Friendly staff, the hotel provided entertainment shows, but need to reserve in advance. Bali safari and marine park – we used a bluebird taxi. Very nice park, we did the safari, attended shows and took photos with wild animals. We took the free shuttle bus back to Kuta. 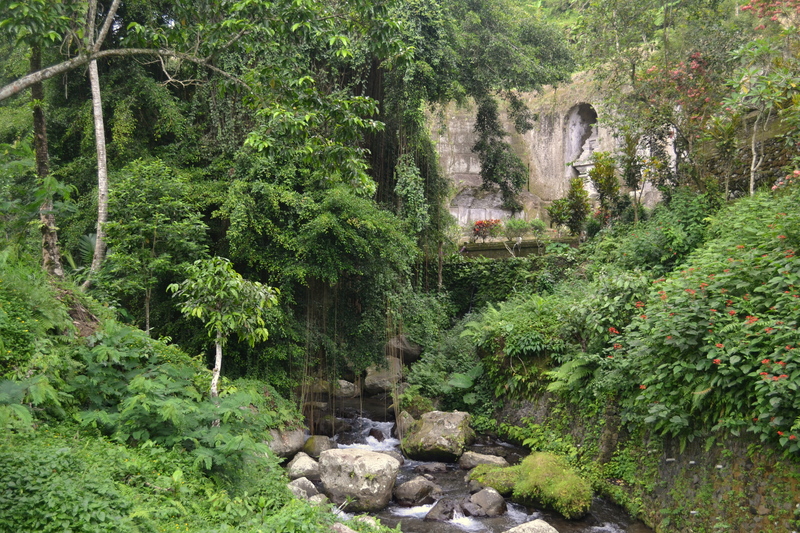 Bali has tropical climate and so basically only Dry Season and Rainy Season exists. What a wonderful and comprehensive article Aarti! Quite helpful for those planning a trip to Bali. Looking forward to more travelogues from you! you have described every detail in a simple manner which makes this blog extremely useful for travelers .